The hotel Saint Merry*** is a former Abbey converted into a charming hotel located in the historic Marais. In a few minutes walk you can reach, the Centre Beaubourg, Notre-Dame, Ile-de-la-Cité and Saint-Germain des Prés. The Louvre and the Champs-Elysees are 10 minutes away by metro. 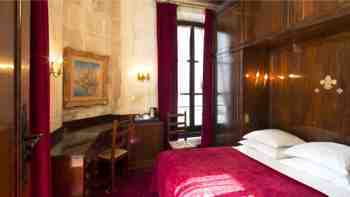 The 12 rooms are decorated with antique furniture and are equipped with a private bathroom, flat screen TV, Wifi access. Also book your place in Rivoli-Sébastopol car park near the hotel and take advantage of the preferential rates exclusively through our website!